Hyundai is rolling out an all-new, redesigned-from-top-to-bottom, kicking-off-a-new-generation Veloster. It's a big year for Hyundai and a big year for those who buy one hot off the delivery truck. What's new, what's changed, and how does this new compact car compare? In this guide, we'll explore those topics, comparing the Veloster to the Ford Focus, and lay down our verdict. We don't have all the information for the 2019 Ford Focus yet, so we'll stick to the 2018 model for that car. But the 2019 Hyundai Veloster is here and deserves a closer look. The Veloster is literally bigger and figuratively badder. That bold new look is because, as the Veloster matures, this Hyundai looks less like a hot hatch and more like a serious muscle car. The interior, with hard plastics tempered with fine graining and seamless assembly. The two-tone colors make everything pop and make sitting in its comfortable seats a feast for the eyes. The base engine has been tweaked to make it a sportier version of its former self. There's also a 2-liter turbocharged engine available, one we'd recommend over the base. The 6-speed manual transmission is fun, especially with the improved clutch take-up and shift action. Finally, there's the Veloster N, a very sporty model available with either a 250- or 275-horsepower turbocharged engine. 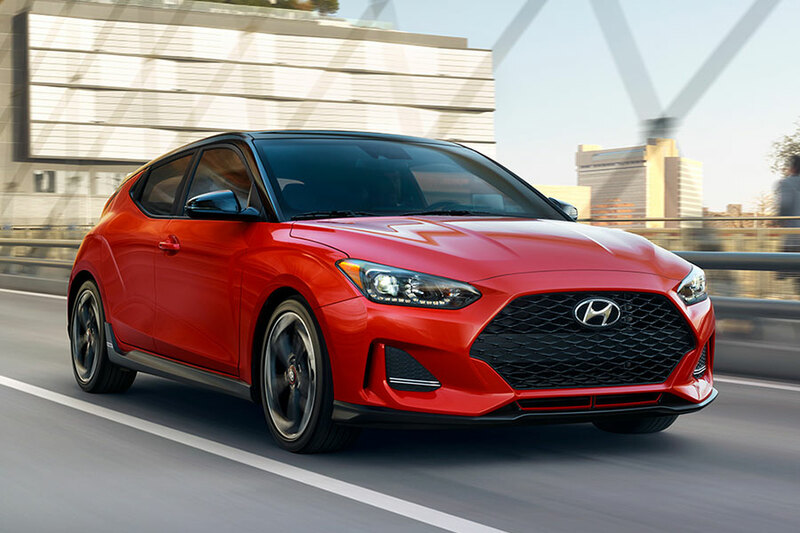 You wouldn't know it from looking at the horsepower and torque numbers alone, but the 2019 Hyundai Veloster is among the quickest, nimblest, most agile cars on the market. You will feel totally connected to the road while driving, with its lightning-fast responsiveness. But you won't feel every bump in the road as the ride remains smooth even over stretches of bumpy road. The Veloster goes zero to 60 in just 7.1 seconds. Only the top-tier sporty trim of the Ford Focus does better in acceleration. The Ford Focus's ride and handling is almost as good in most trims. Acceleration in the sporty RT trim is better than the Veloster's, but otherwise not as great. For example, the base engine goes zero to 60 in 9 seconds flat. At first glance, the Ford Focus seems to be the more affordable option. After all, the Focus starts at $17,950. But that would be for the sedan configuration, not the hatchback. The Veloster, on the other hand, is nothing but hatchback and starts at $18,500. Its standard features include a 7-inch touch screen, two USB ports, Bluetooth, Apple CarPlay, Android Auto, six-speaker audio system, and no fewer than five active safety systems. The first Focus hatchback sells for $20,540, and comes standard with a 4.2-inch infotainment display, SYNC infotainment system, two USB ports, Bluetooth, six-speaker audio system, rearview camera, and satellite radio. Notice the lack of smartphone integration, smaller touch screen, and zero active safety features. For your money, the Veloster is more affordable and nets you more features.